Smartphone shipments are forecast to drop by 0.2 percent in 2018 to 1.462 billion units, which is down from 1.465 billion in 2017 and 1.469 billion in 2016. However, IDC expects the market to grow by 3 percent annually from 2019 onwards. Worldwide shipments should reach 1.654 billion in 2022 -- that's a five year compound annual growth rate (CAGR) of 2.5 percent. The biggest driver of the 2017 shipment downturn was the saturated market in China, which saw its smartphone market decline 4.9 percent year-over-year. Tough times are expected to continue in 2018, as IDC forecasts consumption in China to decline another 7.1 percent before flattening out in 2019. The biggest upside potential in Asia-Pacific continues to be India, with volumes expected to grow 14 percent and 16 percent in 2018 and 2019. Chinese OEMs will continue their strategy of selling large volumes of low-end devices by shifting their focus from China to India. So far most have been able to get around the recently introduced India import tariffs by doing final device assembly at local India manufacturing plants. As for components, almost everything is still being sourced from China. "With 2017 now behind us a lot of interesting market dynamics are unfolding," said Ryan Reith, program vice president at IDC. "Even though it declined 5 percent in 2017, China remains the focal point for many given that it consumes roughly 30 percent of the world's smartphones." According to the IDC assessment, the boom in India is likely to continue in the years to come, but the move toward building up local production has certainly caught the eye of many in the consumer electronics industry. Outside of Asia-Pacific, the biggest regions for growth will be the Middle East, Africa, and Latin America. All three regions have relatively low penetration rates and plenty of upsides. Historically, economic challenges have been the main inhibitor of growth over the past two years. 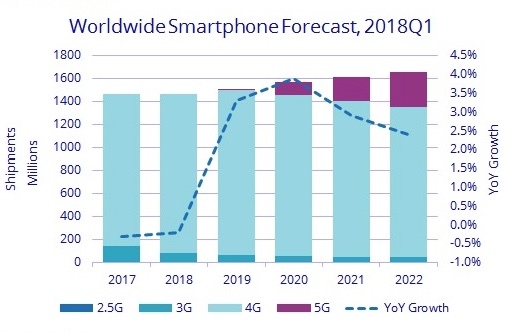 IDC predicts the first commercially ready 5G smartphones will likely appear in the second half of 2019, with a ramp-up across most regions happening in 2020. 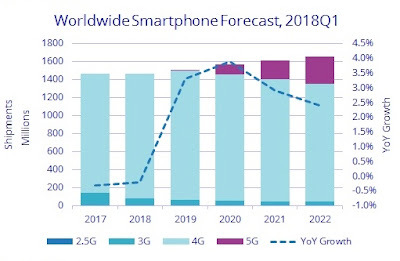 IDC projects 5G smartphone volumes to account for roughly 7 percent of all smartphones in 2020, or 212 million in total. The share of 5G devices should grow to 18 percent of total volumes by 2022. That being said, although overall smartphone shipments will decline slightly in 2018, the average selling price (ASP) of a smartphone will reach $345 -- that's up 10.3 percent from the $313 ASP in 2017. This year many vendors will continue to focus on the ultra-high-end segment of the market, creating a surge of premium flagship devices in the developed markets during 2018.